Of the many, ‘must see’ cities in China, Xi’an is certainly high on the list. It’s considered one of the four great ancient capitals of China and is the eastern terminus of the old Silk Route. Today, Xi’an presents a good example of the contrasts of China. Within the Ming era moated and walled city, are an ever growing number of modern high rises and fancy shopping malls where you can sit at Starbucks and sip your $3 latte while overlooking the Bell Tower. Thanks to the tremendous find of local farmers digging their well back in 1974, most of us go to Xi’an to visit the Terracotta Army. It’s one of a handful of places that everyone asks if we will see while in China and with very good reason. Though there is still much work to be done excavating what’s believed to be an army of 7000 warriors, it is still mighty impressive. 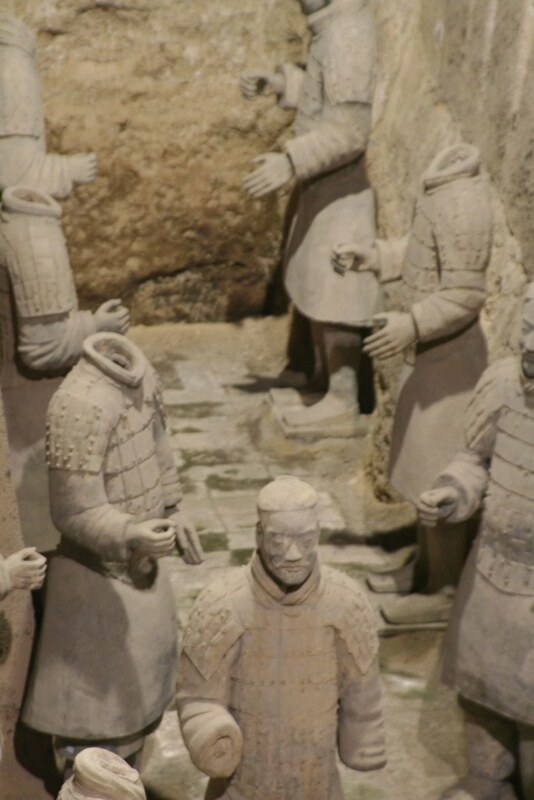 Every warrior is said to be distinct representing actual soldiers in the army of the Emperor of Qin. It supposedly took 700,000 workers 38 years to complete. I’m sure their labor practices were unquestionable! Though we’ll fondly recall our visit to the Terracotta Warriors, Xi’an may be most memorable for our visit to the local hospital. It seems I did something nasty to one of my toes while hiking Tiger Leaping Gorge. At first it seemed like I just jammed it and might lose a toenail. A little pain and inconvenience, but not a big deal. But after two weeks of increased swelling, redness and pain, Dave suddenly became convinced that I was going to lose my toe unless I went to the doctor. Since their was what appeared to be a small hospital just down the street from our hostel, I stubbornly agreed. With our Mandarin phrasebook and laminated medical picture translator in hand, how could we go wrong? All of this undivided attention, including that of most patients and nurses on the floor, and meds cost us a little over $2. And amazingly enough, the toe has resumed looking like a toe and is no longer causing me pain. That mercury is good stuff!